IDC, International Data Corporation, revealed the huge decline in the usage of tablets and traditaionl desktop PCs over the period of time and is continuously decreasing. In 2014, Tablets’ shipment was 56 million units more than the laptops, which was the peak of Tablets reign. 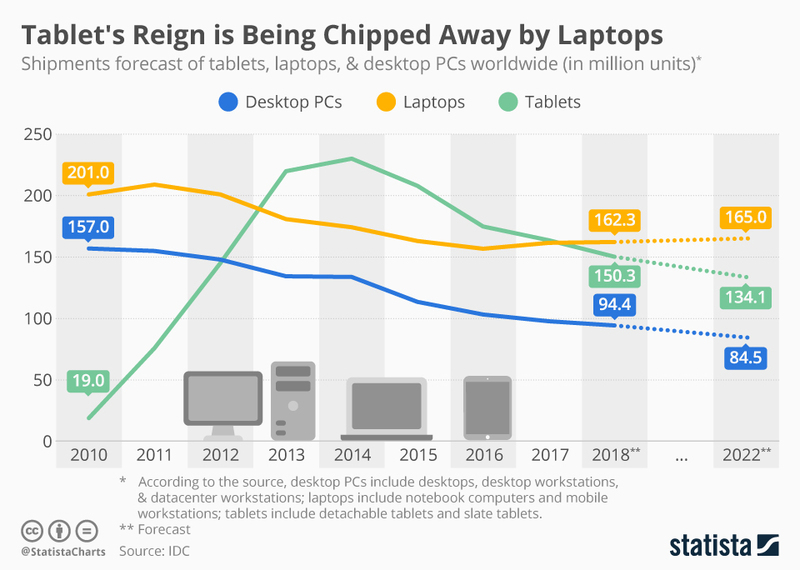 But in 2018, Laptops had 12 million units more shipments as compared to Tablets. Whereas, Desktop computers shipments were more back in 2010 than it was in 2017, with an evident decrease of 60 million shipments. Apple’s iPad hyped tablets in 2010 and it continued for the next five years which led to a decrease in mobile phones and laptops shipments. Users were preparing Tablets over laptops, but now it’s the other way around. Shipments of Laptops have a clear increase as compared to Tablets. The above infographic from Statista predicts the global shipment-forecast of desktop personal computers, tablets and laptops in million of units.